My friend Diana put out a challenge on Facebook a few weeks ago to create a tacky pair of earrings to sport with those lovely ugly Christmas sweaters. I thought it sounded like fun and jumped on board. Unfortunately I can't wear earrings, but that doesn't stop me from making them! 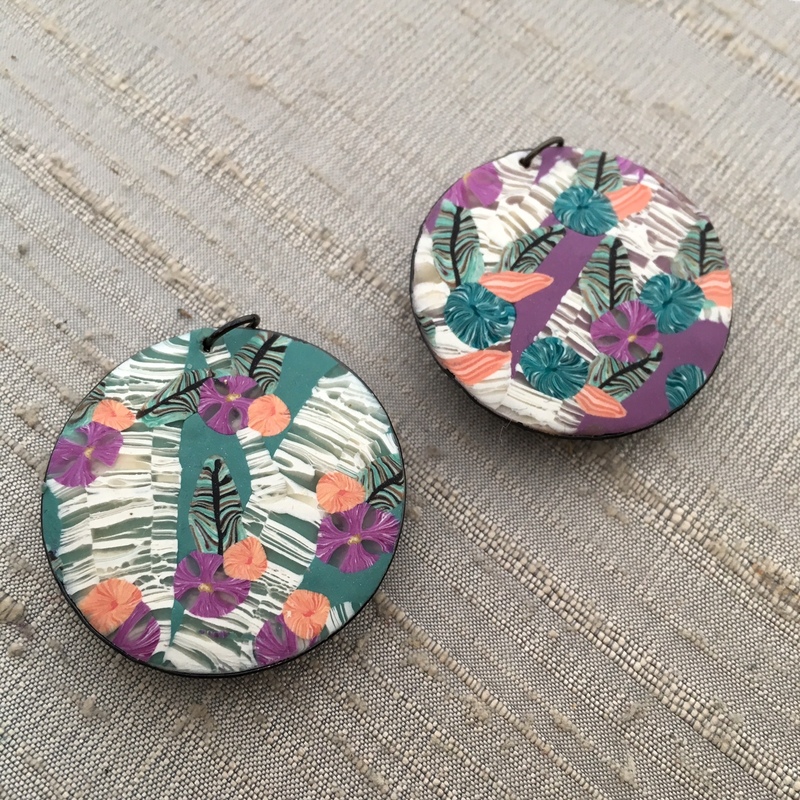 I wanted to create earrings that I could gift to my 20-something daughter and niece, who are always up for fun. I'm not sure if these are exactly tacky, but they are bit more wild than things I'd normally create. So grade me on my Humblebeads scale, these are pretty out there for me! My first pair I used my folk earring charms that were inspired by the patterns of knitted socks. I used large wood beads with Czech glass and tied tinsel-ish ribbon between the beads. I could so see my daughter wearing these with a cute pink sweater, rocking around the Christmas tree. I spotted these triangle frames at the craft store and immediately thought they'd make a good Christmas tree. I knotted them with Czech glass beads in between and added a bit of sparkle for the star. These are some seriously long earrings, the tiny bits of waxed linen at the bottom touch the shoulders! These will go to my niece who wears super huge earrings all the time. Diana Ptaszynksi - Our host! Heather Powers - You are here! 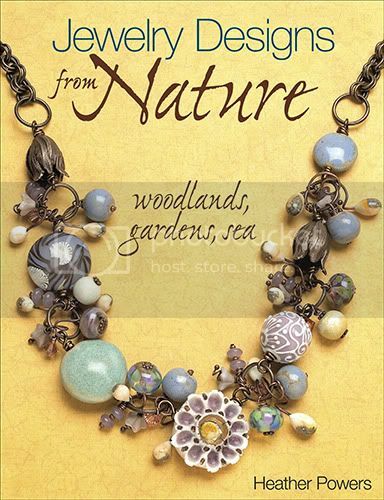 Whip up a woodland inspired pendant in just a few minutes for some instant nature charm! 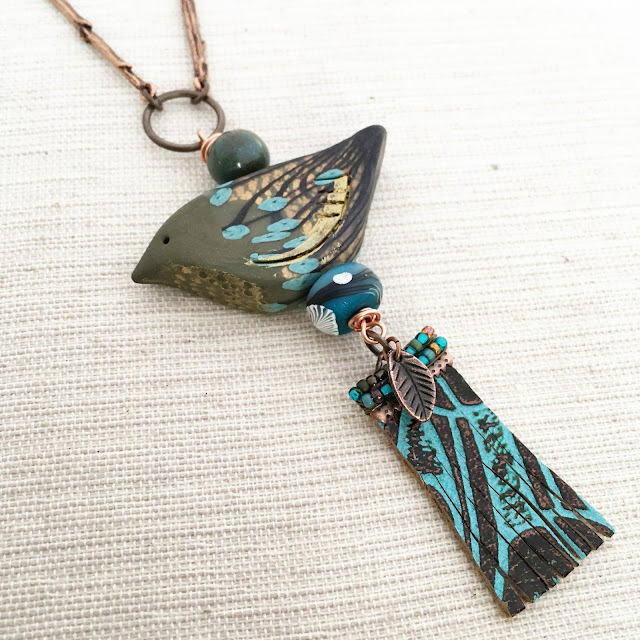 My new Renaissance Faux Copper Leaf Pendant is combined with a colorful collection of Czech glass. 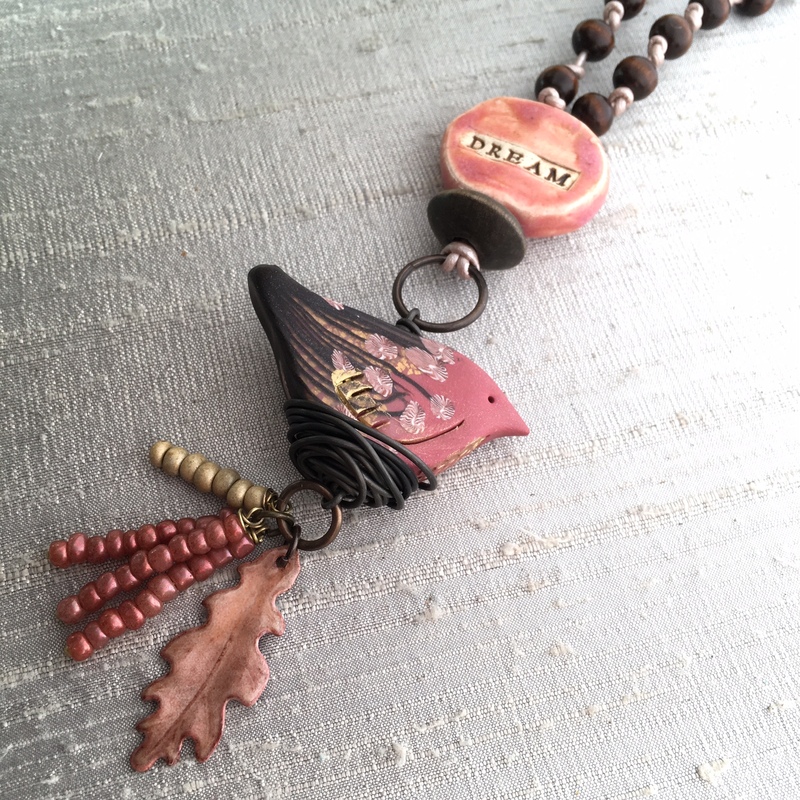 The beads swing from a branch toggle clasp. Tools needs: wire cutters, chain nose, flat or bent nose and round nose pliers. 1. 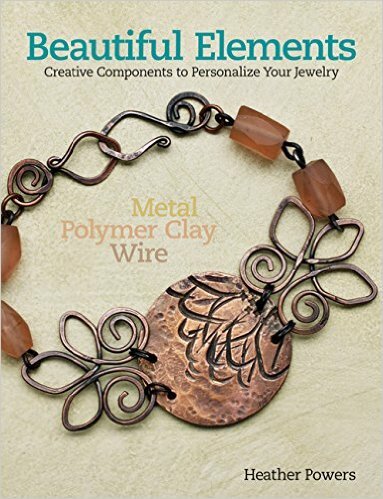 String one glass bead on a ball headpin, create a wrapped loop by wrapping the wire under the headpin twice tightly and two-three times over the top to create a messy wrapped look. Trim excess wire with wire cutters. Repeat with remaining 9 glass beads. 2. 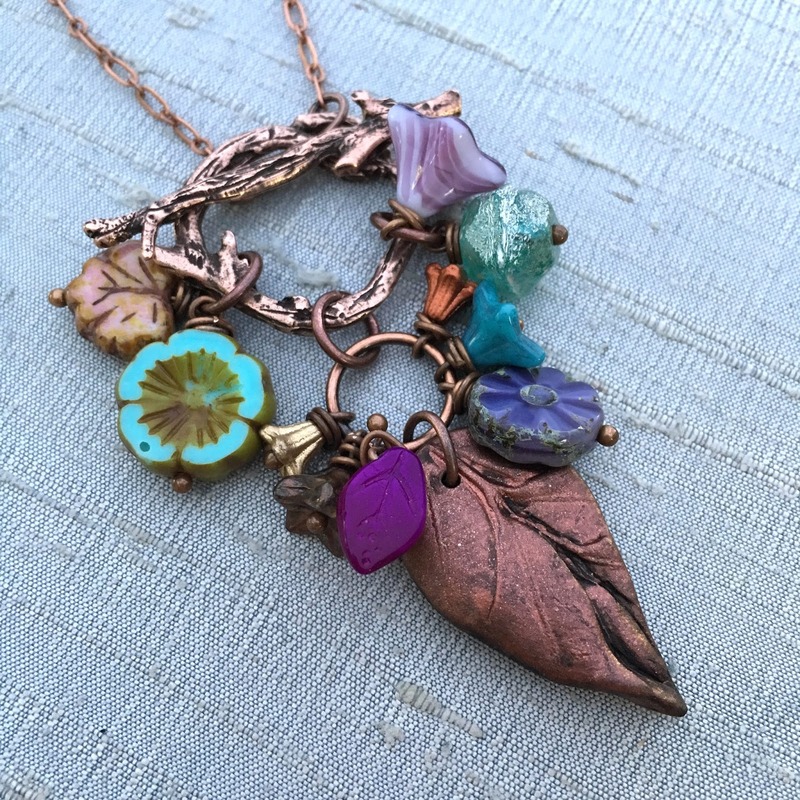 Attach an 8mm jump ring to the leaf pendant. 3. On the 12.5mm jump ring string on the leaf pendant and three of the glass bead dangles on each side of the pendant. 4. Use an 8mm jump ring to attach the 12.5mm jump ring to the ring of the toggle clasp. 5. Use an 8mm jump ring to attach 2 of the larger glass bead dangle to the bottom of the ring of the toggle clasp on one side of the pendant. Repeat on the other side of the pendant. 6. 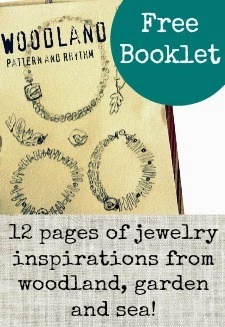 Use 5mm jump rings to attach the ends of the chain to the bar and ring of the toggle clasp. If a shorter chain is desired use either 24" or 20" length chain. 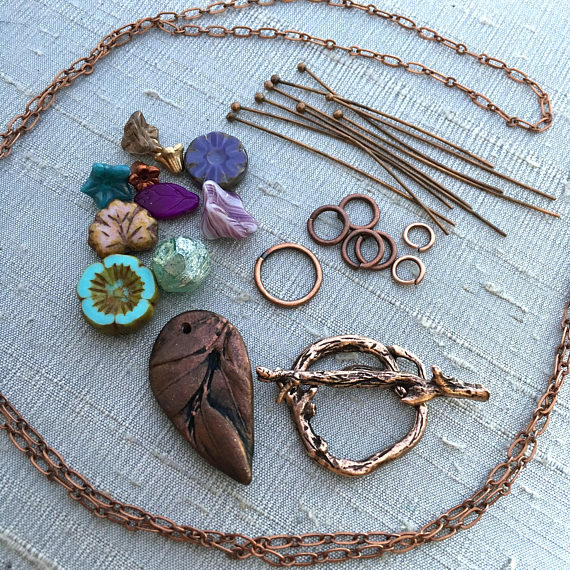 I'm offering a few kits for the necklace in my Etsy shop. 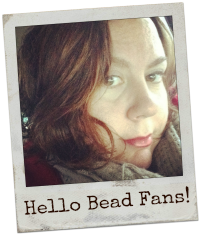 Sometimes in my Humblebeads VIP Party Facebook group I'll ask for suggestions for new beads. 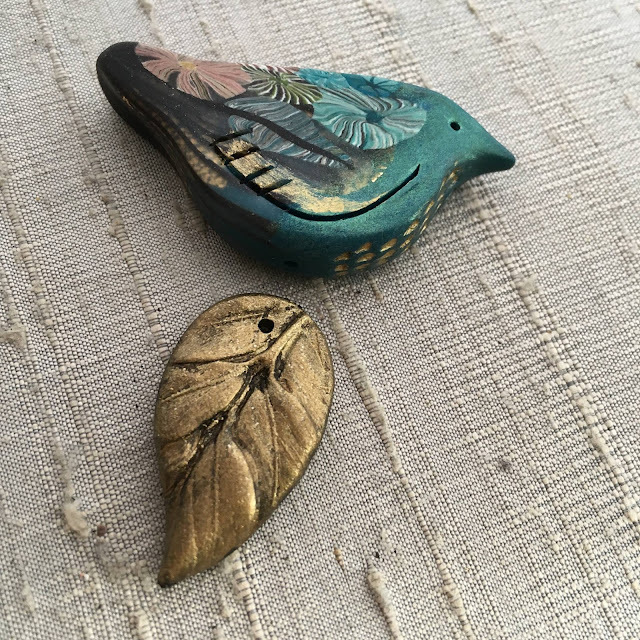 One that caught my eye and pulled my muse in was the request for a leaf that would work with my bird beads. Challenge accepted! 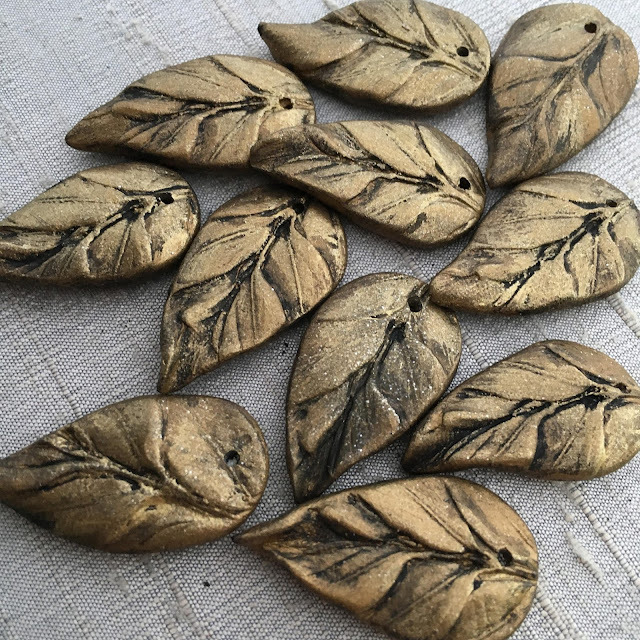 I had a mold from leaves from my front yard and wanted to make a pendant that was romantic, lush and felt like that fit the woodland feel of my birds. 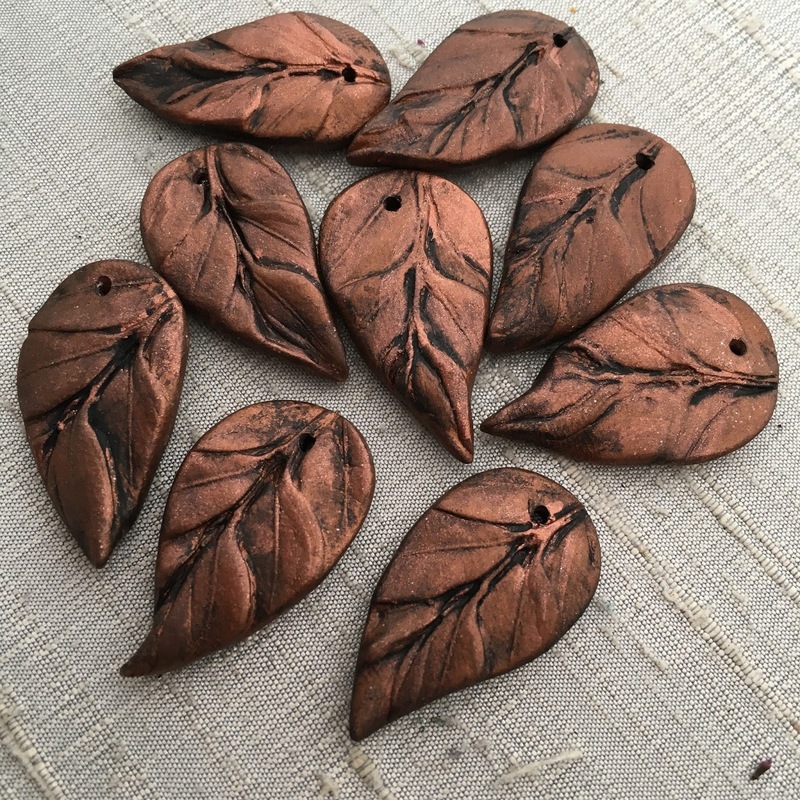 I love them and have been having fun using them in my designs. 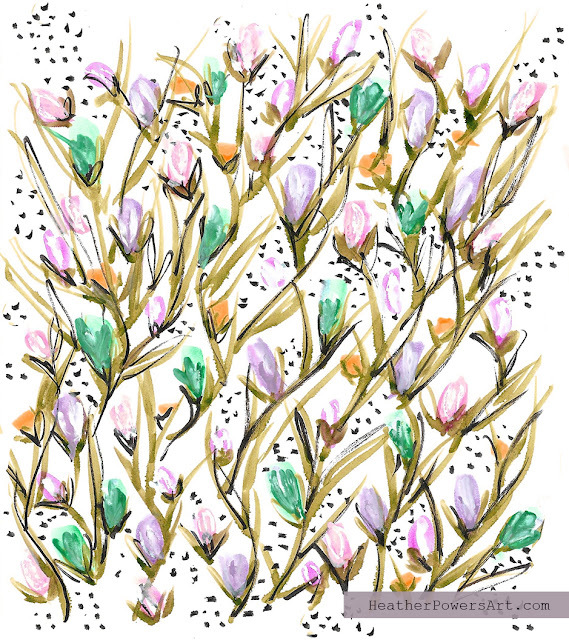 I was so thrilled when Molly from the Halcraft team asked if she could use my artwork as this month's Pretty Palette Inspiration. Halcraft sent me a lovely package of beads for this month's challenge in the hues above and I created a ton of beads in this color palette to match. First up is a bracelet using stones and glass from Halcraft with a Humblebeads toggle and disk beads in coordinating colors. I used the Halcraft beads a fun dangles on the large copper jump rings. The heavy stones in the back help balance out the design and ensure my toggle with stay on the top of the wrist. Next up are the same glass beads with some fun acrylic beads from Halcrft (those faceted teal ones, I love the shape and color!) 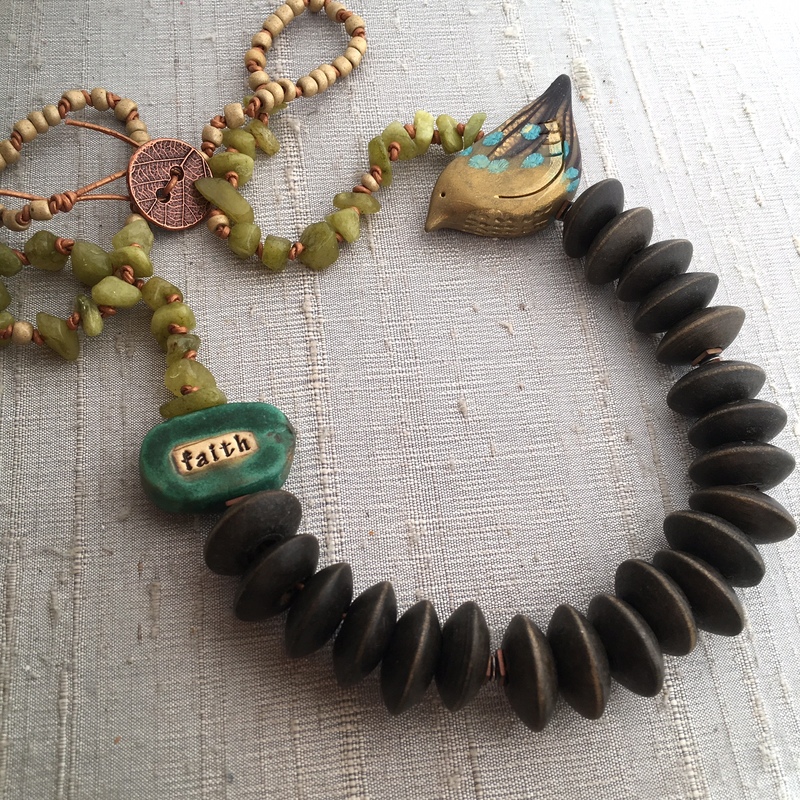 I created a wire fringe for the beads and knotted a very long necklace with a similar bead combination. I used a waxed linen in a rust color for this design. 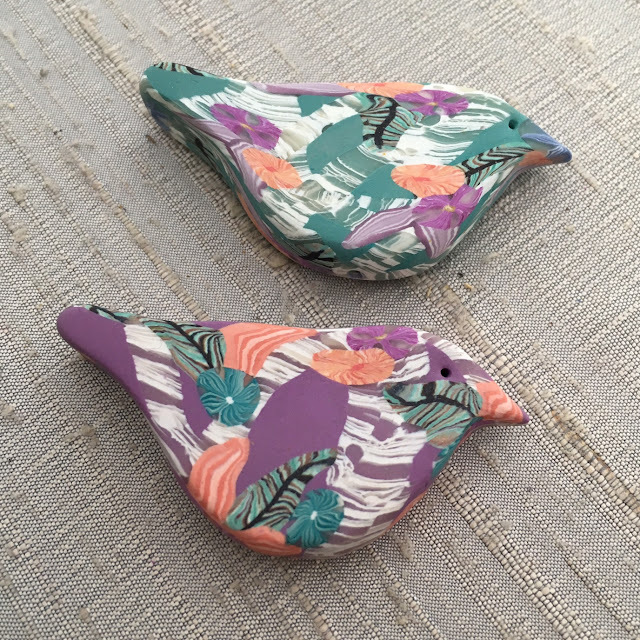 I created the bird with the colors from the challenge. 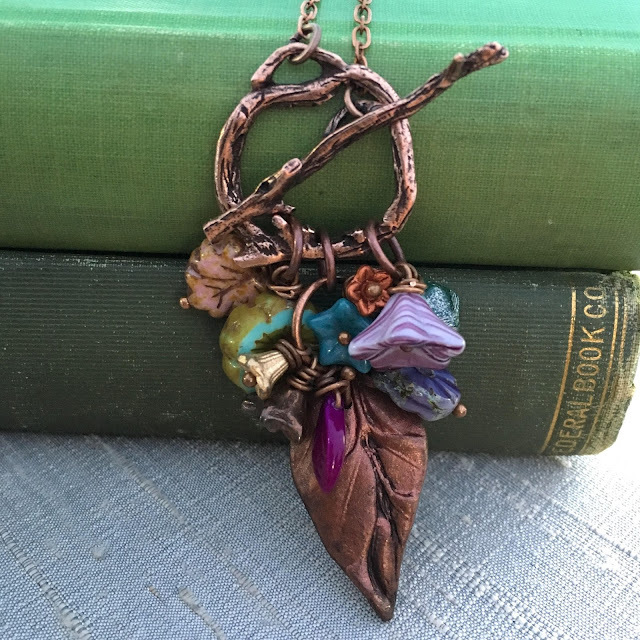 I also used raw copper for a bright pop of metallic color in the necklace. I added in a few spacers in antique copper. I used the same wire fringe design for the earrings with some of the Halcraft beads as accents. 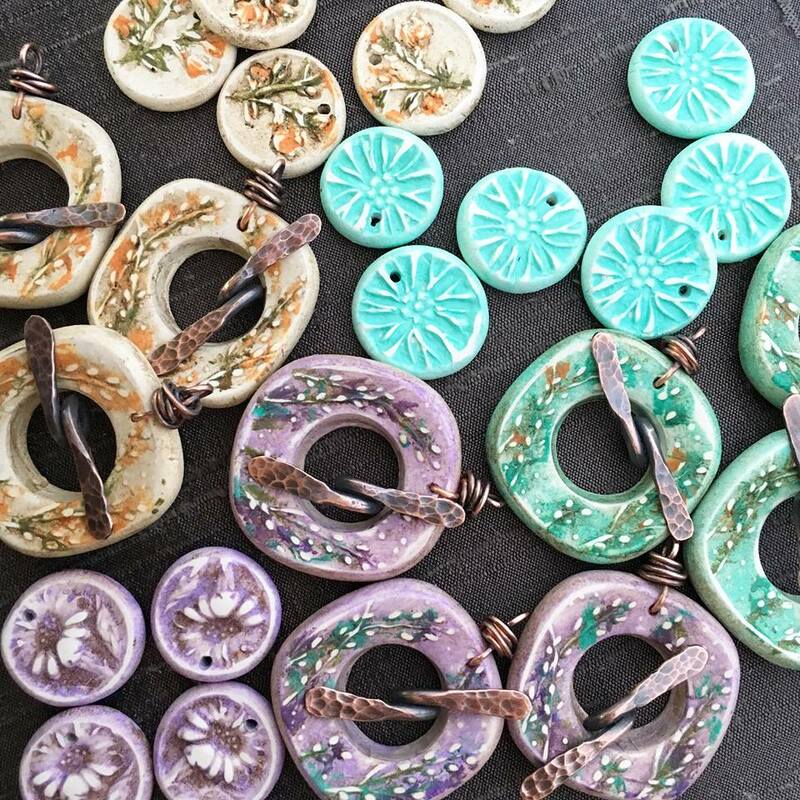 I'll be sharing this technique today on Facebook live for Bead Table Wednesday at 2pm EST. And here is the little tour of some of the beads I made this month inspired by the color palette. You can find beads in my Etsy shop. And I'm super excited to share that the pattern from this month's challenge can also be found on fabric in my Spoonflower shop! Stop on over to check it out. To see more of my art work visit my website at HeatherPowersArt.com. Thank you Molly and Halcraft for another fun month of inspiration. Stop by the Halcraft blog to see what everyone else made for the challenge! I can't wait to see what my creative friends have been up to and how they were inspired by my painting. I was invited this month to participate in Halcraft's Pretty Palette Challenge this month. 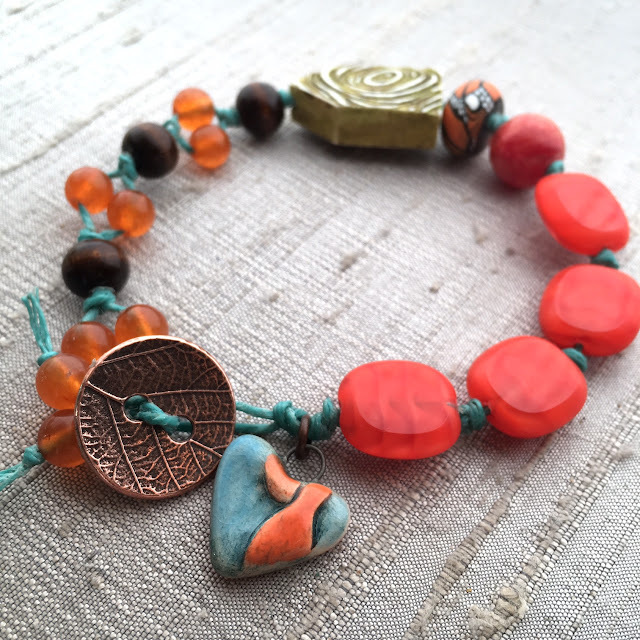 I was gifted an assortment of beads in hues of peach, orange, green and brown. 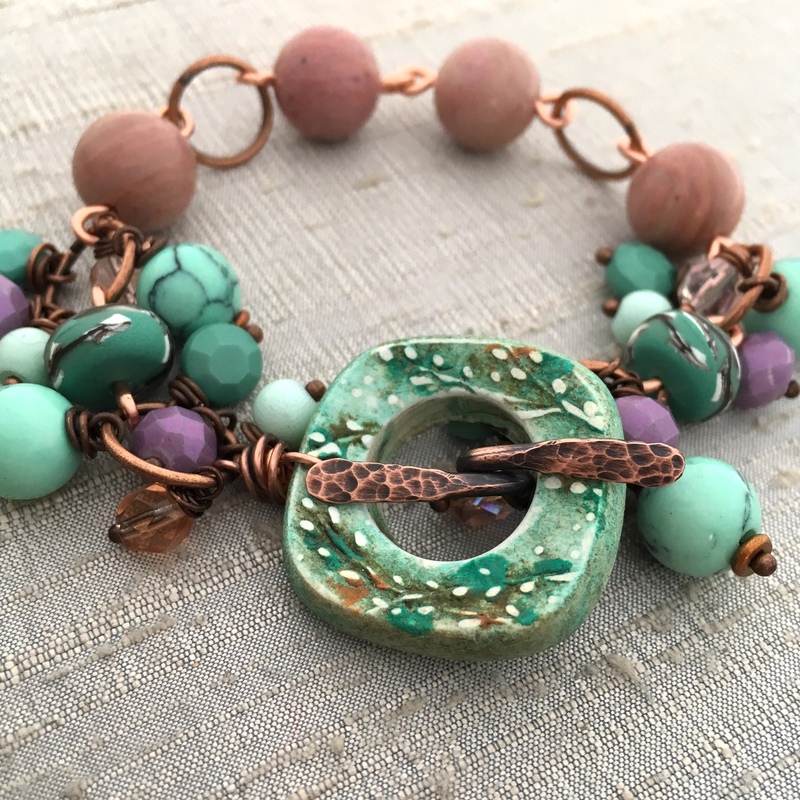 I loved the earthy combination and pulled out some art beads to help add a story to this lovely collection of glass, stones and wood. For those of us in the north that weather through dark, cold and grey winters, it takes quite a bit of faith to trust that the promise of spring is right around the corner by March. Even thought a snowflake may still fall this time of year, once I hear the birds sing for the first time in spring I know the world will soon wake up. I wanted this necklace to capture that faith in the promise of spring! For this first necklace I used 1mm gold leather from Classic Elements and strung on those gorgeous wood disks from Halcraft. I paired one of my Gilded Bramble Birds and Diane Hawkey word bead in shades of green. I was pleasantly surprised that those green jasper chips had large enough holes for the leather, but they did! I don't think I've used chip beads since my beginning days of jewelry making. I have to say I like their organic, rustic look. I used some of the seed beads sent in a mix of beads and finished the design with a leaf button. This design used more the seed beads from the Halcraft mix. 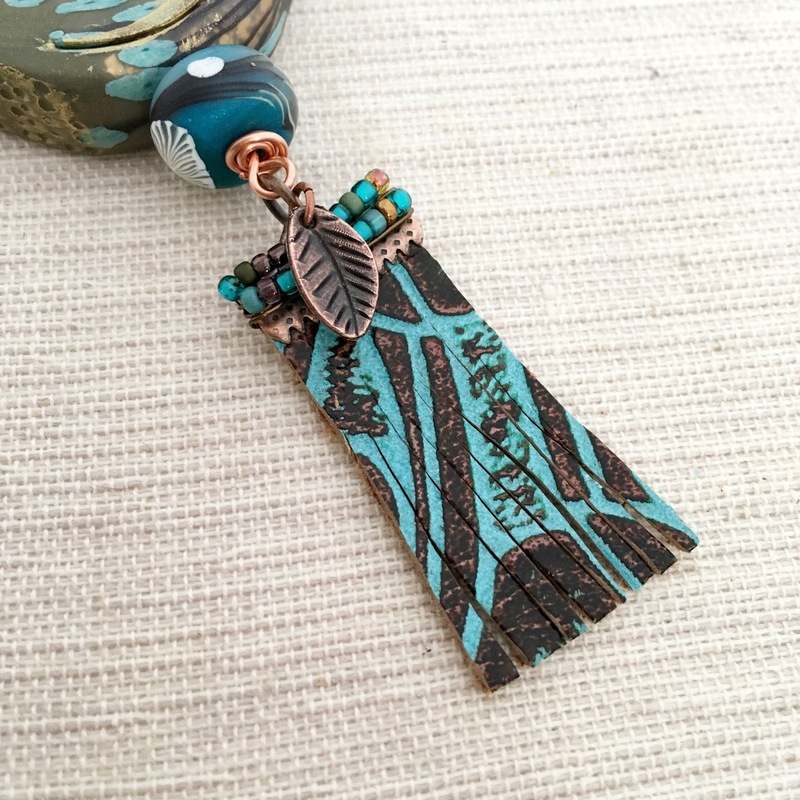 I strung them on headpins to make a tiny tassel with an enamel leaf from Gardanne Beads. I wrapped a wire nest for my Gilded Bramble Bird. I had one wooden disk bead left, so I didn't want to waste that! I used another word bead from Diane Hawkey that was the perfect color and sentiment. On the pearl leather cord I strung wood beads from the Halcraft stash. When I saw these ceramic beads in my package I was both delighted and little scared. These are some big beads girls! I actually almost bought them last month but chickened out because of their size. My goal for this necklace was to make something I'd wear, so I thought simple, little nature thrown in but let those big beads do the talking. 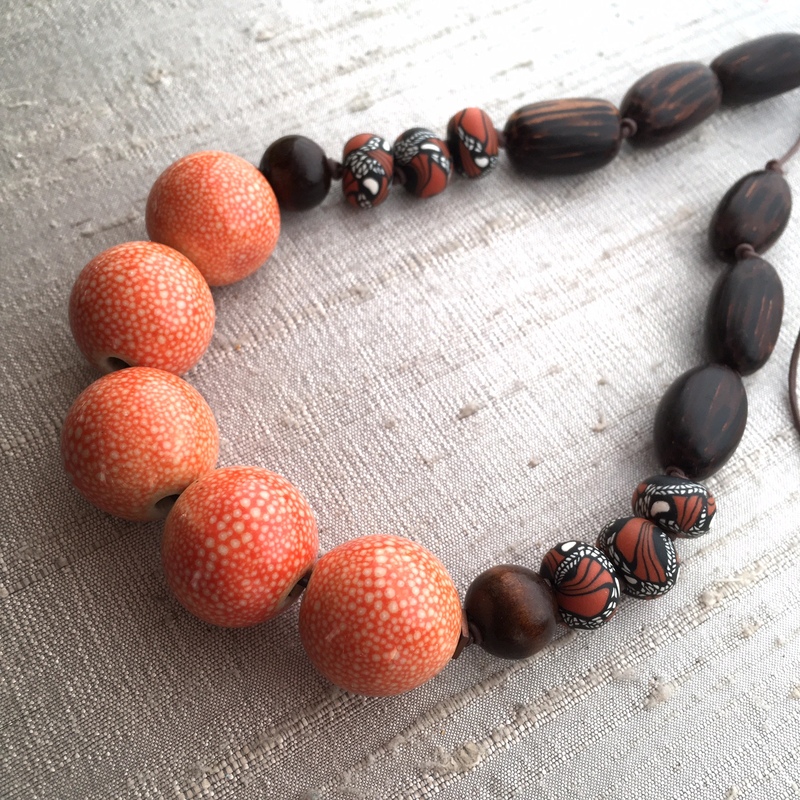 I really love the mottled finish on the beads, they reminded me of my Monarch Beads, so I pulled those out from my stash along with those oval wood beads. The round wood beads are from Halcraft. I strung on the large beads and used a spacer before I knotted the 1mm leather cord that I used for the necklace. 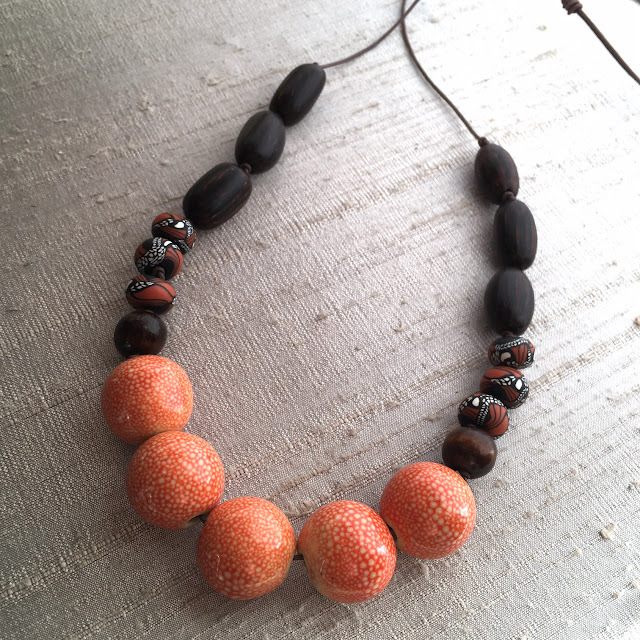 I knotted between all the other beads and finished this necklace with adjustable knots. Simple, but fun and something I'd totally wear. My last design is a knotted bracelet on waxed linen cord. I really went out of my comfort zone with those bright orange glass lentils. But as soon as I saw this tiny heart charm from Mary Harding I knew I could pull it off. 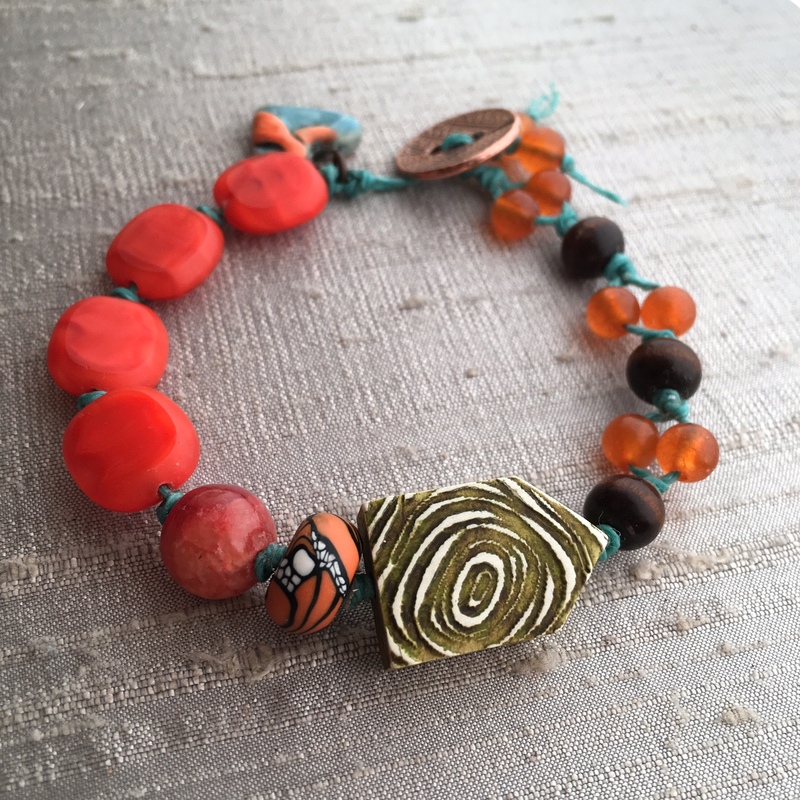 I used one of my Wooden House beads and another Monarch Disk with the glass lentils, quartzite and dye jade beads along with a few more wooden beads. I love how the blue of waxed linen is part of the design throughout the bracelet. I want to thank Molly for inviting me to join in the fun this month and a big thanks to Halcraft for providing the beads and inspiration! Stop over to the Halcraft blog to see more creations inspired by this month's Pretty Palette challenge and to learn more about the beads. Gilded Bramble Birds, Monarch Beads and Wooden House beads can all be found at my website, www.humblebeads.com. I love this embossed leather and have been having fun finding all sorts of ways to use it in my jewelry. I created this tassel with a small ribbon clamp and wire-wrapping beads around it for a little extra embellishment. 1. Evenly cut the end of the leather into 1/8” strips, leaving the top half inch of the leather uncut. 2. Wrap the end of the wire around one side the ribbon clamp two times. With the wire facing the front of the ribbon clamp string seed beads as the same length as the clamp. Wrap the wire around the front of the clamp again. String on another row of seed beads. Wrap the wire around the front of the clamp two more times. Make sure the wire is wrapped very tightly each time. Trim the end of the wire so it is shorter than the clamp. 3. Insert the leather piece into the clamp, use chain nose pliers to close the clamp tightly, squeezing under the beads to close it securely. Re-position the rows of beads if needed so they lay straight across the clamp. 4. Add the leaf charm to the 4mm jump ring, close the jump ring. Add the ribbon clamp loop and the leaf jump ring to a 6mm jump ring. Leather: PeggySueAlso.etsy.com. Leaf charm and jump rings: YadanaBeads.etsy.com. Seed Beads: WhimBeads.com. Ribbon clamps: WhiteWillowCreek.etsy.com. In the example I paired up my leather charm tassel with coordinating disk and birds from Humblebeads.com and a round ceramic beads from FireflyDesignStudio.etsy.com. The branch connectors are from NunnDesign.com. 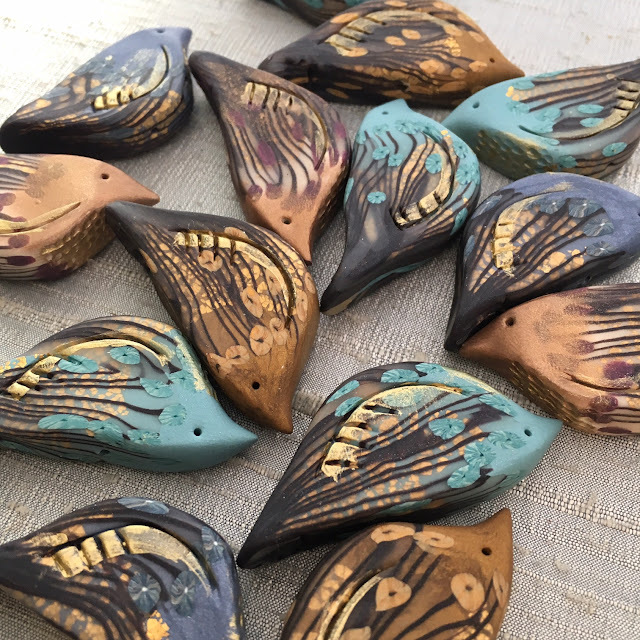 My Gilded Bramble Birds are now part of my regular line of beads that can be found at humblebeads.com.